Before we officially welcome in the New Year, we can’t help but sit back and reflect on some of last year’s highlights. 2015 was a great year, not only for us, but also for the genomics sector, with revolutionary debuts from Illumina’s HiSeq X Ten launch, PacBio’s announcement of the SEQUEL and great strides accelerating Precision Medicine. Here’s a quick round up of notable moments for DNAnexus in 2015. JANUARY: DNAnexus supports Natera’s NIPT portfolio globally. Our Chief Medical Officer, David Shaywitz, visits the White House. FEBRUARY: The Garvan Institute expands into global genomic sequencing services. MARCH: DNAnexus sets record for fastest human genome assembly with FALCON, completed in in <21 hours, and Intermountain deploys their clinical cancer genomics test on the cloud. APRIL: DNAnexus partners with WuXi NextCODE to bring cloud-based genomics to China. MAY: Regeneron on track to sequence 100,000 exomes by year end. JUNE: DNAnexus supports data management and genomic analysis for a global research consortium. DNAnexus powers research and analysis of rice genomes to help feed the world’s population and supports Ebola research in the cloud. JULY: DNAnexus named in MIT Technology Review’s 50 Smartest Companies. AUGUST: DNAnexus selected by the FDA as the contractor to build precisionFDA. DNAnexus supports both projects selected by California Precision Medicine Initiative. CareDX adopts DNAnexus for company-wide clinical and R&D activities. OCTOBER: BioNano and DNAnexus collaborate to expand access to next-generation mapping. Collaboration with QIAGEN to integrate Ingenuity Variant Analysis. 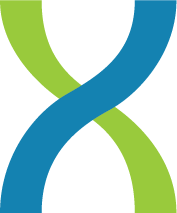 NOVEMBER: ICGC dataset now available on the DNAnexus Platform. DECEMBER: DNAnexus delivers precisionFDA open beta. For all of us here at DNAnexus, this has been one heck of a rocket ship ride and we’re happy you’ve been able to join us on our journey. 2016 promises even more opportunities for fruitful collaborations. Bring it on 2016! DNAnexus is hosting a Grant Challenge along with Instrumentl, a funding platform for science, to help fund genomics research projects. DNAnexus and Instrumentl are offering $1,500 in Research Grants that can be applied to the researcher’s overall Instrumentl crowdfunding campaign. In addition to the $1,500 in research grants, DNAnexus will provide the winner a $5000 credit for compute and storage costs to run genomic analyses on DNAnexus. Unfortunately, traditional funding opportunities like grants and fellowships are not keeping pace with the exponential growth of genomics research. The goal of this grant challenge is to expand funding for genomics research and to allow researchers and scientists to focus on what really matters, the science, not searching for funding. The individual who raises the most funds will receive a $750 DNAnexus Research Grant. In addition, Instrumentl will be matching DNAnexus’ grants by awarding second and third place individuals with a $500 and $250 Instrumentl Research grant, respectively. Thirteen research teams have been selected to be a part of the Genomics Challenge covering a wide variety of subjects including supersized genomes in desert rats, mapping the hybridization of sugarcane, and investigating orthopedic defects. Don’t delay, donate to a worthy genomics project today! Voting is open through January 5, 2016. The Bonus Grant ($5,000 DNAnexus credit) winner will be chosen on January 23rd. For more information check out the complete Genomics Challenge rules. Last week, we had the pleasure of attending Festival of Genomics California. We hope you were able to catch some of the truly inspiring talks from the plenary speakers, such as Karen Nelson from J. Craig Venter Institute, Manolis Kellis from MIT Computational Biology Group, and Carlos Bustamante from Stanford University School of Medicine. Our big story at the conference was about precisionFDA – an open source platform to advance regulatory science about NGS-based analytic tools and datasets. DNAnexus is under contract with the FDA Office of Health Informatics to assist the FDA in preparation for a December 15th launch by developing the precisionFDA portal and assisting in the engagement of the genomics community. At the Festival, we organized a panel moderated by Omar Serang and George Asimenos who led a discussion involving Deanna Church, Personalis; Michael Eberle, Illumina; Kevin Jacobs, 23andMe; and Justin Zook, NIST. We kicked off a closed panel discussion with a video overview of precisionFDA. George showed screenshots of the precisionFDA platform, highlighting examples of how the community will be able to use the platform, including the variant call comparison tool that can compare results between a test dataset and a benchmark/reference dataset, and separate out true positives, false positives and false negatives. From there, the panel delved into a lively discussion. Deanna pointed out that only roughly 1500 out of the 4000 genes that have some clinical relevance are represented in their entirety in the Genome in a Bottle/National Institute of Standards (NIST) and Technology NA12878 dataset. Therefore, the precisionFDA community needs to spend time expanding that sample, not just adding more samples to the community’s database. Michael stressed the importance of pedigrees in validating variants in a reference sample. Kevin made a passionate speech for how the community needs to focus on conventions. How can we possibly enter an era of precision medicine if we are still unable to agree on where the human genome exons are located? Researchers use computers and algorithms to calculate the results with binary formats, however the reality is the computer is only doing what the human researcher tells it to do, and since humans are not very precise, how can we be confident in our results? Justin stressed the importance that NIST should not be the standards-making body for dictating these standards, they need to be developed and agreed upon by a community. In addition to its variant call comparison functionality, the precisionFDA platform will allow participants to conduct in-silico experiments using software and publish their conclusions in the form of electronic notes that can be placed with their experiments and reference the data and analyses. Using this feature, participants have the opportunity to showcase to the community their views on certain “hot” topics such as “the utility of simulations”. Be sure to visit precision.fda.gov and follow us on @precisionFDA to get the latest. The platform will be accepting applications for membership in the community beginning December 15th! In addition, we also want to thank Sure Genomics for joining us in our booth to demo their product and discuss how the DNAnexus Platform analyzes their customer’s whole genome sequencing data. During the festival Sure Genomics and DNAnexus announced two lucky winners that will have their genomes sequenced and analyzed by Sure Genomics. Each winner will receive a complimentary Personal DNA Kit, personal DNA report mapping key markers, and one-year free storage. Blazing fast. That’s the only way DNAnexus runs, whether in the cloud or on the treadmill. 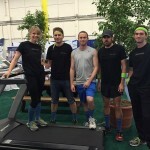 DNAnexus repeated its June victory in Boston to win the Race the Helix Treadmill Challenge in California. We also want to thank all those that stopped by our booth. We look forward to seeing everyone again next year at Festival of Genomics Boston.